"A Danish study published in the British Journal of Psychiatry found that almost half of patients treated for a cannabis-related mental disorder went on to develop a schizophrenic illness. People who had used the drug developed schizophrenia earlier than those with the illness who had not smoked marijuana." "The two men met privately in Cameron’s office. Not only was Davis assured he could keep his job as shadow home secretary, Cameron even agreed to his rival’s request to shelve plans to downgrade the classification of the drug ecstasy." In agreeing with Mr Davis on this issue Mr Cameron has avoided a potentially very disruptive row. 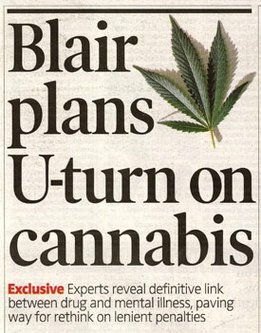 He is also starting to fulfil his hustings promise to decide drugs policy by collective shadow cabinet agreement. Mr Davis was a strong opponent of Mr Blunkett’s 2003 decision to downgrade cannabis and he will pressurise Mr Cameron to support Tony Blair’s upgrading of the drug. Without that support the Tories will face the kind of attacks that The Sun aimed at the LibDems during the last election. Soft on drugs and soft on terror could otherwise become a major weapon in Labour’s currently uncertain attempts to curtail the Cameron honeymoon.